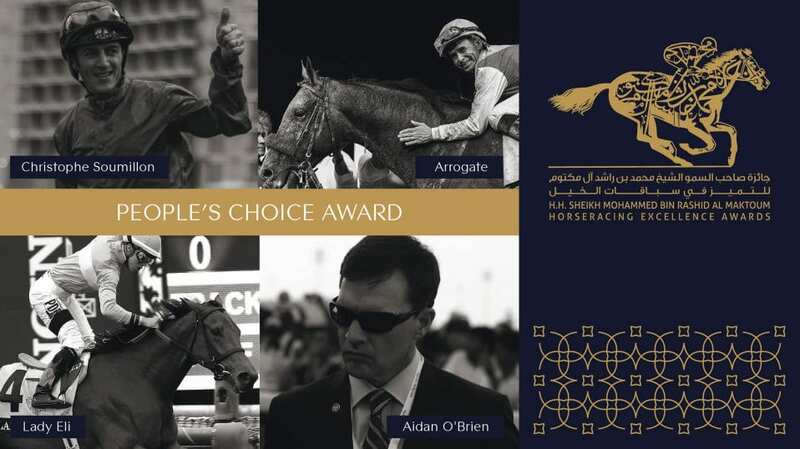 Dubai Racing Club is pleased to announce the four finalists for the People's Choice Award, a fan-voted accolade recognising the most compelling 2017 moment in horseracing. The award will be given at the HH Sheikh Mohammed bin Rashid Al Maktoum Horseracing Excellence Awards ceremony on the evening of March 29, 2018, two days prior to the richest day in global horseracing, the $30 million Dubai World Cup card. Voting will take place during the month leading up to and ending on Meydan Racecourse's Super Saturday, March 10, 2018. Please click HERE to vote or copy and paste the following link into an internet browser: http://www.hhracingawards.com/vote. Christophe Soumillon Broke the European Winners Record – Christophe Soumillon broke the European winners record of 300 on a calendar year, shedding his label as solely a 'big race rider' and taking to the road, air and trains to go to every small and big racecourse in France that would provide him with victories. The Belgian-born jockey accomplished said feat despite obligations to the Aga Khan's operation, displaying the same passion he did when crowned France's champion apprentice in 1999. The 36-year-old rode 1,635 races on 965 individual horses over a total distance of more than 3,000 km to achieve a record of 306 wins. Lady Eli's Amazing Comeback – From life-threatening Laminitis to newly crowned Champion Turf Female, near-death to national darling, Lady Eli made an amazing comeback from mid-2016 through the end of 2017. With the assistance of a dedicated team, including owner Sol Kumin's Head of Plains Partners and the stable of trainer Chad Brown, the Breeders' Cup winner overcame a mercilessly crippling disease that has claimed the lives of countless racehorses. Showing the same bravery she did on the racetrack, Lady Eli did the impossible and recovered an even better racehorse, winning Grade 1 races from coast-to-coast in the United States and stamping herself as one of the top turf stars in the world. Arrogate's Unforgettable Last-to-First Performance at the Dubai World Cup – Trained by America's premier classics conditioner, carrying the colours of one of the great royalties of racing, Juddmonte Farms, and ridden by one of the top jockeys on the planet, Mike Smith, Arrogate's anointing as racing's next superstar in the 2017 Dubai World Cup was supposed to be easy. That was, of course, until the gates opened… Squeezed back and spotting the field multiple lengths, all appeared lost until the eventual two-time world champion electrified the sporting world with a last-to-first performance that solidified him as one of the best racehorses in decades. Aidan O'Brien Conquers One Record After Another – There are many records trainer Aidan O'Brien was set to conquer in his superb career, but few more daunting than the world record of 25 Group/Grade 1 wins set by iconic American trainer Bobby Frankel in 2003. O'Brien not only met the record, he went bursting past to 28 wins across the globe in 2017, all while displaying the class and humility with which his work has become synonymous. This entry was posted in NL Article, The Biz and tagged aidan o'brien, arrogate, bobby frankel, Christophe Soumillon, dubai racing club, dubai world cup, horseracing excellence awards, juddmonte farm, Kei Chiong Ka-kei, lady eli, people's choice award, sheikh mohammed bin rashid al-maktoum by Press Release. Bookmark the permalink.